What is the product warranty for Computer Essentials? Computer Essentials has a Two Year Warranty on all new desktop systems. Extended warranties are also available for an additional year. Will Computer Essentials take my machine as a trade in? Computer Essentials will take your machine as a trade in on any new or used system providing it has Windows Vista or newer. If you can tell us the Processor speed (CPU). the Hard Drive size and the amount of memory (RAM) it would make the evaluation much simpler. Our warranty covers all parts and labor due to any manufacturer's defect, power surge or electronic failure. The warranty does not cover viruses or software compatibility. Does Computer Essentials repair more than just desktop computers? YES! We repair pc and Mac Laptops, iPads and other tablets, as well as iPods and some phones. If you are curious about whether we will repair your device, give us a call or stop by. Where can I find replacement batteries or AC Adapters for my Laptop? 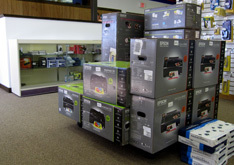 Computer Essentials can special order almost any battery or AC Power adapter you might need. Give us the model of the notebook and we will get you a price on a new Notebook battery or AC Adapter. Usually you will have it in 3-4 days and we can drop ship if you like. We also carry universal adapters in the store at some of the best prices around.